A fun loving & eccentric New York billionaire has hidden the will to his vast fortune somewhere in New York City! His family only has 17 hours to locate the will or their Grandpa's entire estate will be given to his cat & dog. You are the world famous Mystery P.I. and the family has hired you to track down the clues hidden all over NYC. Seek & Find over 2100 hidden objects in 25 amazing NY locations like Times Square, Central Park, Coney Island, the Brooklyn Bridge and many more. If you succeed you will be awarded $25 Million dollars. 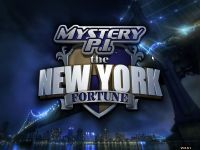 Three addictive ways to play: In NY Fortune mode you must find the clues to locate the will. Collect all the Keys & Apples to unlock two Unlimited game modes: Unlock Unlimited Seek & Find and Spot the Differences to find every hidden item in every scene.